Buzzy Belew (Danny Kaye), a popular nightclub comedian, proposes to fellow entertainer Midge Mallon (Vera-Ellen) on the eve of his scheduled appearance before the District Attorney to testify against murderer Ten Grand Jackson (Steve Cochran). But two of Jackson's henchmen, Chimp (Allen Jenkins) and Torso (Edward Brophy) kill Buzzy and throw his body in the lake in Brooklyn's Prospect Park. Buzzy's identical twin brother, Edward Dingle (Danny Kaye), is a shy but brilliant bookworm. 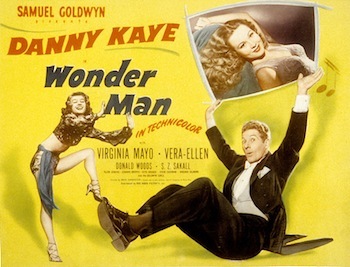 Librarian Ellen Shanley (Virginia Mayo) invites him to dinner, where Edward begins to hear strange music in his head and voices saying "Buzzy" and "Prospect Park". When he leaves to go to a deli for potato salad, the voices get stronger and he takes a bus to Prospect Park. Buzzy appears as a ghost and tells Edwin that he will, at the appropriate time, enter his body to testify against Ten Grand. Edwin goes to Buzzy's nightclub and attempts to impersonate his brother, but confuses everyone with his radically different personality. But Buzzy enters his body just in time to do his performance. In the audience are Ten Grand, Chimp and Torso, surprised by Buzzy's apparent survival. Edwin has fallen in love with Ellen, while Midge is beginning to have doubts about the changed man she knows as Buzzy. And Ellen is frustrated with Edwin's strange behavior and bizarre explanations about his situation. Edwin learns that the District Attorney (Otto Kruger) will be in the audience at the opera, so he goes there with plans to give him his testimony against Ten Grand. But Chimp and Torso arrive, and Edwin puts on an opera costume and ends up on stage where he ad libs singing with the show's diva. Buzzy's ghost takes over his body and he sings the key facts of the murder to the District Attorney. The police arrive and take the gangsters into custody. Buzzy's spirit is freed, and Edwin and Ellen marry. 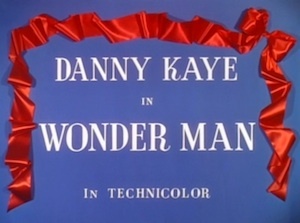 Wonder Man was suggested for this site by Karine Philippot.